2 What is Linea Aspera? 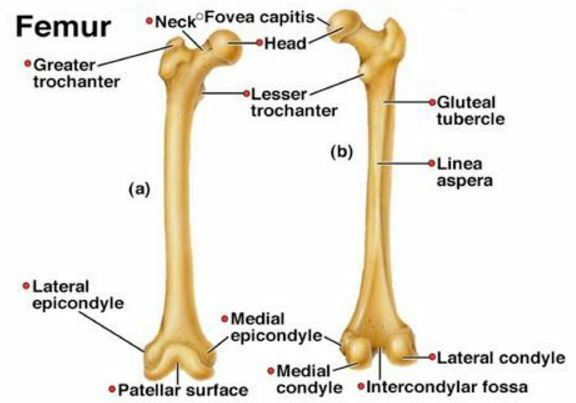 The femur is considered to be the strongest and longest bone in the body. 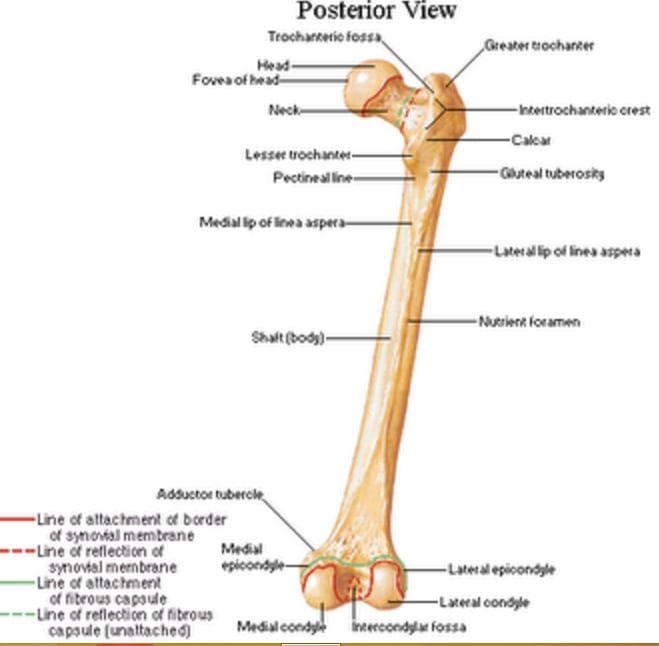 It is the only bone that is found in the upper legs and it extends from the pelvis to the knee. Like every other bone in the body, it has marks and features that makes them an ability to connect to other bones. 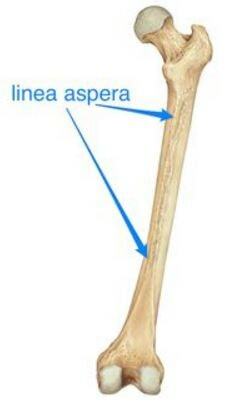 The linea aspera is one of the distinguishable marks of the femur [1, 2]. The linea aspera (LA) is the distinctive ridge found along the posterior aspect of the femur. When translated from Latin, LA means “rough line.” LA is the roughened, longitudinal irregular crest that is composed of 2 lips. This feature is the insertion site of the adductor thigh muscle. It is the origin of several muscles in the thigh. [2, 3, 4]. The LA is not present in younger people and it starts to emerge during the pubertal stage. This feature becomes more prominent as an individual advances with age. It has been hypothesized that the LA is formed where the axial intracortical stress is the greatest. This location stiffens the femur effectively during bending [2, 4]. This ridge on the femur serve as the insertion point of several muscles. The vastus medialis originates from the medial lip of the LA while the vastus lateralis attaches from the lateral lip. The adductor magnus is inserted into the LA and between this muscle and the vastus lateralis is where the gluteus maximus and the short head of the biceps femoris originate [4, 5]. Type I (Parallel) – The lateral and medial lips of the LA and all the widths that have been measured are equal. Type II (Concave) – The widths of the proximal and distal ends of this ridge are the largest while the middle width is the smallest. Type III (Convex) – The width in the middle part of LA is the biggest while those of the ends are the lowest. Type IV (Variform) – In this type, all the widths of the LA are all different. Variform LA is considered to be the most common type found in humans accounting for around 40%. The parallel and concave types make up about of 25% each while the convex type is about 5% of the population . 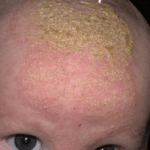 Knowing all the possible variations of the LA will be beneficial in detecting possible tumor growth such as a calcinosis-like growth that may be located in the LA. There is a possibility that this growth may be mistaken as a part of the LA. Gaining knowledge about the variations in its morphology may assist in ensuring an appropriate clinical diagnosis [3, 5]. The main function of the LA is the support and stabilization of the femur during walking and running as it serves as the attachment site of several muscles. Because of its involvement in daily activities, LA develops due to the use and strengthening of the muscles. Aside from this, the LA may function as a resistance pole which can stiffen the femur within its forward prominence [3, 5]. The topography of the LA is essential in the performance of surgical procedures on the femur. It is helpful in a modified transfemoral approach or in the posterior approach of the femur. Drainage of the venous blood vessels along the LA will decrease the risk of embolism and cardiopulmonary impairment during an operation. In a cemented total hip arthroplasty, the LA is an important area for the protection against fat embolism [3, 5]. The location of the principal nutrient foramina is very important for orthopedic surgery. The foramina is found on the LA in 72.5% of the population. There are several branches of the profunda femoris artery that runs through the LA. Information about these vessels can help reduce the risk of bleeding during a surgery [3, 5]. Moore, S., Milz, S., & Knothe Tate, M. (2014). The linea aspera: a virtual case study testing emergence of form and function. Folia Morphologica, 273-280. Polquj, M., Blizniewska, K., Jedrzejewski, K., Majos, A., & Topol, M. (2013). Morphological study of linea aspera variations – proposal of classification and sexual dimorphism. Folia Morphologica, 72-77.